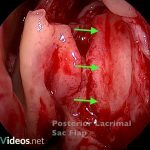 This narrated video demonstrates the excision of an accessory lacrimal sinus or fistula and the insertion of a mini Monoka stent to protect the normal canaliculus. It discusses the different surgical options for this rare condition. This procedure is being done under the operating microscope to aid visualisation. Saline syringed through the normal punctum emerges freely from the accessory sinus, as this is the path of least resistance. Hence this patient has epiphora. A Bowman probe is inserted into the normal canaliculus. The metal probe can be seen down the accessory, confirming that in this case, the sinus is relatively short and that great care will need to be taken to avoid damaging the normal canaliculus during excision of the sinus. A biopsy punch can be used to core out the accessory sinus. However, the 2mm punch is a little too large for this sinus. A Bowman probe is inserted into the sinus and the sinus excised down to the level of the probe that is in the inferior canaliculus. It is probably possible to excise it in one circular core, but it is difficult because of the mobility of the tissue, obscuration by blood and caution for the normal canaliculus. It is excised piecemeal. Dispersive viscoelastic gel is instilled from time to time to protect the cornea. A mini Monoka stent is placed in the inferior canaliculus. It has been cut to around 20mm and with a tapered end. Siting them can be frustrating as they keep bouncing back off the medial wall of the lacrimal sac. However, with repeated attempts at different orientations it almost always will turn the corner in the lacrimal sac and not bounce back. The plug at the proximal end is pushed into the punctum. The defect created by the excision of the sinus is closed. Here we are using a 7-0 vicryl horizontal mattress suture. The mini Monoka was removed 2 months later and there was no evidence of recurrence of the sinus 6 months post-operatively. Alternative surgical interventions have been used for accessory lacrimal sinus excision. Excision of the mouth of the sinus and then closure of the conjunctiva across the sinus is the least interventional has minimal risk of damaging the normal canaliculus but probably has high recurrence rates because of tears passing into the residual portion of the sinus and gradually the sinus re-epithelialising towards the surface. DCR surgery with sinus excision is also described. The DCR is actually downstream of the aberrant anatomy, but the reduced resistance to flow of the shortened drainage system may facilitate tears passing down the normal canaliculus and help prevent recurrent of the sinus. Satchi K, McNab AA. Double lacrimal puncta: clinical presentation and potential mechanisms of epiphora. Ophthalmology. 2010;117(1):180-3 e2.